WASHINGTON — U.S. employers likely kept adding jobs at a healthy pace in January even in the face of threats ranging from weakening global growth to the Trump administration's trade war with China to the partial shutdown of the government. FILE - People attend a job fair at Dolphin Mall in Miami. On Friday, the Labor Department will issue the monthly employment report, the first major economic report to cover most of the 35-day shutdown period that ended a week ago. Economists have forecast that employers added 165,000 jobs and that the unemployment rate remained at a low 3.9 percent, according to data provider FactSet. The predicted job gain would be a solid one, though it would follow a blowout figure of 312,000 jobs that were added in December. The partial government shutdown, the longest on record, isn't expected to have had a significant effect on the January jobs report. That's because of how the government will categorize the 800,000 federal workers who weren't paid for five weeks. All will be counted as employed in the government's count of jobs in January. That means the economy will almost certainly record the 100th straight month of job gains, a record. 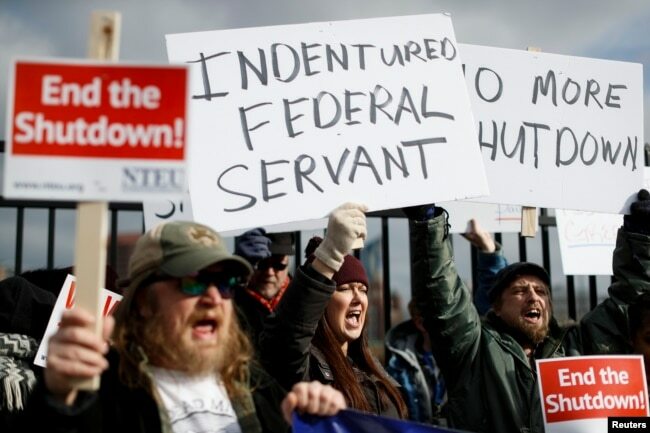 Union members and Internal Revenue Service workers rally outside an IRS Service Center to call for an end to the partial government shutdown, Jan. 10, 2019, in Covington, Ky. Still, some of the roughly 380,000 federal workers who didn't work and weren't paid might be counted as unemployed in a separate survey the government uses to calculate the unemployment rate. If so, this could inflate the jobless rate by 0.2 percentage point, economists say, though the effect would be reversed in February as federal employees return to work. Unlike some government agencies, the Labor Department received its annual funding before the shutdown and has operated normally throughout. "The shutdown was very traumatic for federal workers, but it will probably not show up in most of the data for private sector workers," said Andrew Chamberlain, chief economist for the employment site Glassdoor. One unknown factor is the impact of the shutdown on government contractors, who perform a wide range of jobs - from janitorial work to data management. Some of them who were furloughed may receive back pay. But some won't, and they could contribute to a higher unemployment rate and lower job count. Still, a solid jobs report would provide reassurance that the economy remains mostly healthy and likely to shake off any effects of the shutdown. One positive sign emerged Wednesday from the payroll processing company ADP. Its survey found that private businesses added more than 200,000 jobs in January. The ADP data doesn't cover government workers and doesn't always mirror the government's official monthly jobs report. But it suggests that the shutdown had little effect on private-sector hiring last month. In another encouraging sign, the number of people seeking first-time unemployment benefits reached a 49-year low two weeks ago, though the figure jumped higher last week. "The fact that the labor market is hanging so tough is a reason for optimism," said Mark Zandi, chief economist at Moody's Analytics, which helps compile the ADP data. "As long as we are producing jobs at this pace, the economy will do OK."
The government shutdown will probably end up slowing the economy's growth for the first three months of the year. The nonpartisan Congressional Budget Office estimates that the shutdown lowered annual growth for the January-March quarter by about 0.4 percentage point, to a rate of 2.1 percent. Thousands of government workers who missed two paychecks slowed their spending. The federal government itself also spent less. In addition, many businesses across the country lost income. Tourists cut back on visits to national parks, for example, thereby hurting nearby restaurants and hotels. Yet even employers whose revenue dropped might have held onto their workers during January, Zandi said. With unemployment so low and many companies struggling to fill jobs, layoffs might not have been widespread. Chamberlain said that Glassdoor's data shows the number of job postings rose nearly 9 percent in late January compared with a year earlier, suggesting that demand for labor remained strong. The shutdown has delayed the release of a range of government data about the economy, including statistics on housing, factory orders, and fourth-quarter growth. The reports that have been released have been mixed. The Federal Reserve's industrial production report showed that manufacturing output rose in December by the most in nearly a year, boosted by auto production. But consumer confidence fell in January for a third straight month as Americans' optimism dimmed amid the shutdown and sharp drops in the stock market. Falling confidence can cause consumers to restrain their spending, though economists note that confidence typically returns quickly after shutdowns end. The housing market has clearly slumped as mortgage rates have increased. Sales of existing homes plunged in December and fell 3.1 percent in 2018 from the previous year. Mortgage rates have fallen back after nearly touching 5 percent last year, but the number of Americans who signed contracts to buy homes still declined in December. China's economy is decelerating sharply and Italy's economy has entered recession, exacerbating fears that slower global growth will cut into U.S. exports. Fed Chairman Jerome Powell on Wednesday cited the weaker global economy as a key reason why the central bank will be "patient" before it raises its benchmark interest rate again. That was a sharp turnaround from January, when Fed policymakers forecast two additional hikes for this year.